If your little guy is like most then he’s probably superhero obsessed. You being the cool parent that you are of course want to make sure all his wishes are fulfilled, while he might be a little young to be a real Dark Knight, but that's no reason that he can't look the part. 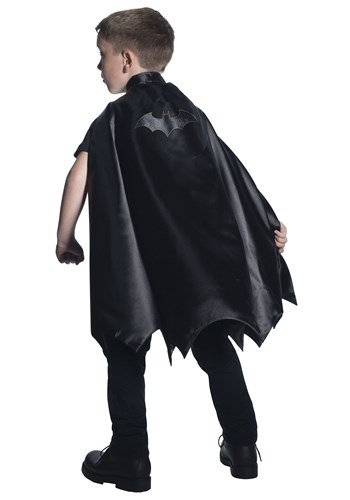 Add this deluxe Batman cape for kids to his Batman costume and he'll feel like he'll be ready to take on Gotham's baddest. He'll have a great time trick or treating or showing off at his first costume party. And hopefully he won't have to deal with any little Jokers messing up his plans! Good luck getting him out of this Batman cape after Halloween ends, you may just have to deal with grocery shopping and running errand with your own personal superhero. Hey, things could be worse.